Rocking and Rallying all over the Riviera! If you are wanting to take part in a car rally, then the Ladies Vintage Car Rally is a must! Martine Ackermann, founder of the charity Child Care Monaco organised this spectacular and fun event to raise funds for children in India. It took place on Sunday 16th Septmber, 2018. With no less than 85 women and 35 Vintage Cars participating, this was guaranteed to be an extremely exciting day. There were also 8 designated drivers so women who didn't want to drive themselves could enjoy being chaparoned and soak up the atmosphere. Before hitting the starting line breakfast took place at the Café de Paris, where further rules and regulations were discussed. Every year the Rally takes on a theme. Now in its' 5th year, Martine decided that this year everyone taking part would wear something based on 'Nautical and Stripes'. Martine: This is our 5th Ladies Rally. The idea came to me one morning... I was looking for an idea to fund raise and make people happy. It had to be with ladies who enjoyed having fun and embraced our solidarity philosophy. It was in a flash that the idea of organising the Rally came to me immediately! At 9am everyone jumped into their vintage classic and headed in the direction of Cannes and then it was a short boat ride to the Islands of Lerins for lunch at the Bazaine Tower of St. Marguerite. After returning to the harbor, the ladies in their cars headed for the Vallauris Art School and were warmly greeted by the director of the tourist office of Vallauris Mr. Philippe Mottier and his team. Following a visit to the Espace Grandjean and the Espace Madoura where Picasso created his ceramics, the excursion was rounded off by a delicious tea with specialty biscuits and sweets made by the artisans in Vallauris. The Rally continued its journey and then returned to Monaco to the Place du Palais where waiting to meet the Ladies Rally was the Secretary of State Jacques Boisson, the President of the National Council Stéphane Valeri, the Minister of the Interior Patrice Cellario, the Deputy Mayor Jacques Pastor, Mr Gery Mestre the President of the ACM Collector's Commission. "This spirit of solidarity is essential to advance and change things." Says Martine Ackermann "The world today is certainly not a paradise but each act of solidarity helps to make it a better place. Motivation and a strong meeting of minds are just two of the factors that make this Rally extremely successful. Women who believe in solidarity and driving change were fundamental to the success of the charity in achieving the goals they set. 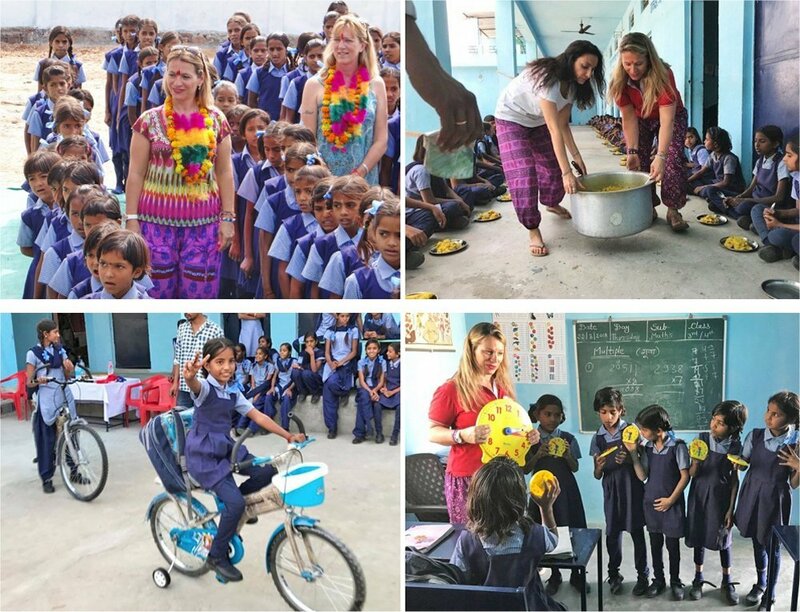 The construction of the girls school in the village of Trestha, India in 2015 allowed Child Care Monaco to welcome 110 school girls. The money raised at last year's Rally created the kitchen, a caretaker's lodge and the space to park the bicycles that were given to the school last November. This year an impressive €15,000 was raised making the project to build a clinical wing, possible. Martine will be travelling to India shortly accompanied by Annie Battaglia (Vice-President of Child Care Monaco) and her daughter. There will also be 2 students making the journey to assist, and others who have a humanitarian mission to carry out on site. Question? What are the challenges you face when travelling to India and how do you solve them? Martine: "My first challenge is myself!! I am full of motivation but the journey is long and very tiring, and then arriving there, life is so different with Monaco. Trying to understand each other is not always easy, and you require a great deal of patience when asking for something! The most challenging part is for the reason I am there... seeing all those poor kids affects me a lot. It's a hard psychological work that I have to deal with every time I am there and also when I return back home. I solve those challenges by reminding myself that doing something to help will make a huge difference to these children and their families. I meet, speak and spend a great deal with the families, and visit them at their homes. I learn such a lot from them and they learn from me. This is really a moment of sharing." I wanted to show my kids that we can always do something to make a better world and we decided together to do something for the underprivileged kids we met during the trip." recalls Martine. The Ackermann family witnessed first hand a great deal during the trip, of children living on the street without shoes asking for something to eat. It was impossible to ignore the unbelievable things that they saw. On her return to Monaco, Martine created an NGO 'Child Care Monaco' with the intention of doing whatever she could. Very shortly after, Martine returned to India and built the school. The mission with Child Care Monaco is to help girls in India to have an education and to show them that this can be done from another part from the world. "When we are more established and stronger, we will also help the boys too." says Martine. The goals for next year are already being discussed. Martine would like to have a Library Bus in Jaipur where there is a great deal of poverty. "The bus already exists but needs support. When I visit in October I will then be able to see what can be done." confirms Martine. Question? Do you have any other events this year? Martine: "Our next event will be the Xmas Gala on Saturday 8th of December at Salon Bellevue, Café de Paris, Monaco. Please do check our website for further details."